On Episode 55, I had the pleasure of interviewing designer Kate Oates about her latest book, Math For Hats. This is a great little book packed full of useful information for hat knitters of all levels. I will be putting my copy to good use! To enter to win this adorable collection of prizes from Tot Toppers, please leave a comment (including contact information) under this post. Only one comment per person please. 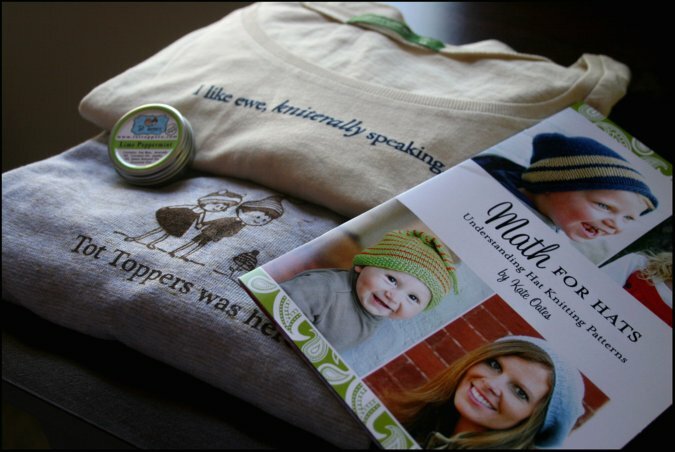 The winner will receive a signed copy of Kate's new book, Math For Hats, along with two really cute Tot Toppers tees and even a tin of her homemade lip balm! I'll be announcing the winner here on August 15th, so be sure to check back and see if you have won! Congratulations to grandmastatus, the winner!